The other week we had a new executive start at my work. I stopped by her office today and offered to help her with Notes if she had any problems. I asked if she had used Notes before, and she said no, she came from an Outlook shop. So I asked her what she thought about Notes this far. She told me that the mail experience was very close to Outlook, with sortable columns, etc. She als told me that she really like the action buttons with dropdowns for reply, etc. The fact that different windows are available in different tabs was another thing she liked. She then switched over to the workspace and told me how she loved it, and how it was much better than Outlook, easy to find things, etc. I then quickly showed her how she can name the different tabs, change color and organize her icons. She was very impressed, and liked that. For the last week or so, she have been meeting with different departments, and yesterday she got to meet with IT. We went through the different applications we have, and we explained how the different Notes applications are tied together with each other, as well as with several other systems. This is something else she is very impressed about, and she told me that that level of integration was something she had not seen at her previous workplace. This spring is gearing up to be very interesting. The rumors are flying about both an upcoming new iPad and a new Samsung Galaxy Tab. According to the rumors, Samsung will launch the new Samsung Galaxy Tab 11.6 at Mobile World Contress in Barcelona at the end of this month. The new tablet will (again unconfirmed) have a 11.6 inch screen with a resolution of 2560×1600 and be powered by a 2GHz dual-core Exynos 5250 processor. Some rumors talk about a quad-core processor, but I personally find that unlikely in this first version. The operating system will, not surprisingly, be Android 4.0 (Ice Cream Sandwich). Despite the bigger screen, the actual size of the tablet is said to not be much larger than the existing Galaxy Tab 10.1. As soon as Apple releases one product, rumors start about the next generation. But it seems very plausible that an iPad3 will be released this spring (the rumors talk about March). Here rumors talk about a quad-core processor in the 1MHz range (but the rumors are all over the place which processor it will be and exact clock speed), and a new graphics chip driving the 9.7 inch display with a resolution of 2048×1536 pixels, double the resolution of iPad2. A redesigned interior to allow a bigger battery is also probably, based on leaked pictures of the case. 4G LTE support is also a pretty good bet. The iPad3 will supposedly be slightly more bulky that the existing version, about 1.5mm thicker. I guess time will tell, but this spring could be very interesting for tablets, and the summer/fall will be interesting for smartphones. Expected launces of iPhone 5, Samsung Galaxy S3 and phones from RIM with Blackberry OS 10 (QNX-based and rumored to be able to run Android apps) are the ones I see as the most interesting. How many times do you not want to count the number of documents you process, perhaps even a few different counters? Today I was working on a Lotusscript agent where I wanted to keep track of the total number of documents processed, as well as individual counters for a few different types of documents. Normally I would have used a handful of variables, but I realized that I could use lists for this. That’s it for today. Happy coding! During the last couple of weeks I have revisited some of the sci-fi classics I read when I was young. Robert A Heinlein was always one of my favorites. In what would be considered middle school in the US (4th-6th grade) we had one hour each week when the class was reading whatever book we had picked out in the library. At one time, I think it was in 5th grade, I read the Swedish translation of "Have Space Suit ?Will Travel". The other week I listened to this book as an audio book. This one was actually more of a radio theatre play, with different actors playing the different parts. I then followed this by listening to "Citizen of the Galaxy" and "Double Star". The books were written in 1956, 1957 and 1958, and I noticed something interesting. Despite them taking place in the future, where space travel (even faster than light) is possible, and with all kinds of exotic technology available, many things we take for granted today are lacking. In "Double Star", the main character is studying using an encyclopedia in the ships library. As we know today, online encyclopedias like wikipedia and internet searches have all but killed off the traditional printed encyclopedia. There is no way for a printed publication to stay current. If a celebrity or any other person dies, within minutes their wikipedia page will be updated with date/time and cause of death. In "Citizen of the Galaxy" the missile control computers onboard the trade ships are manned by young adults with good math abilities. They seem to be somewhat aided by a rudimentary computer, but it is mainly the operator who calculate trajectory and time for release of the missiles. The result is recorded on a spool (which can be read by humans, so probably some kind of paper-like material). The concept of digital storage did not exist, and I am sure any PC (or even smart phone) today could perform the calculations needed much faster than any human, and with greater accuracy. Some of the books also talk about huge archives, using micro film. Even if that still today is a great medium for long term storage, it is not the best choice for the kind of short term archiving used in the books. Again, the concept of digital storage does not appear in the books. The books basically build on the technology known in the 1950´s, but "enhanced" as imagined in the future. However, there is on interesting thing in "Double Star". When recordings are made (for public broadcasts), they are "stereoscopic", i.e. 3D. It is not until the last year or two we have actually seen 3D television become common. Personally I believe that we soon will see 3D television sets where we don´t need to use special glasses (several manufacturers already have those) and that more and more tv shows and even news will be in 3D. All this is not a slam on Robert A Heinlein or any other sci-fi writer from the past. It just illustrates how hard it is to predict a paradigm shift like PCs or the development of technology. For being almost 60 years old, the books are still very enjoyable. 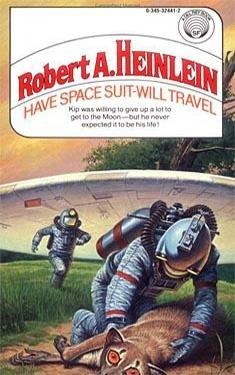 If you have not experienced Robert A Heinlein yet, pick up one of his books or an audiobook at the library, bookstore or favorite online retailer. The discussion about the IBM rebranding of different products, including removing "Lotus" from a number of products, have me got thinking. What is really in a name? Well, a product name is really not that different from a person name. We have a firstname/surname which is our identity, and a lastname/family which indicate what family or group we belong to. In some cultures the family name is listed first, but the idea is the same. Sometimes we also have a nickname that we are know as, or that our friends call us. When a woman get married, she often takes the family name of her husband, or combine her family name with his. Jane Doe becomes Jane Smith or even Jane Doe-Smith. A product is often named the same way. Lotus Notes, Lotus Domino, Lotus Sametime. When IBM took over ("married") Lotus, eventually the name became "IBM Lotus Notes, IBM Lotus Domino, etc. We continued using the "nicknames" Notes, Domino and Sametime, as they are shorter and easier to say/write. I am sure we all remember when Sametime was renamed "IBM Lotus Instant Messaging" and Quickr was renamed "IBM Lotus Team Workplace". The names were quickly changed back”…” Not that the names were bad, they actually explained much better the nature of the product. But they were much harder to remember and did not have the familiarity people needed. Compare that with if I would change my son´s name from Erik to say Allen (which happens to be his middle name). That would cause a lot of confusion. And if you dropped the "family name" part ("IBM Lotus"), like we all do in normal conversations, the result did not provide any good branding. "Do you use Instant Messaging?" Some products have already lost the Lotus part. We now have "IBM Sametime", and at Lotusphere, it was announced that "IBM Docs" is the new name for LotusLive Symphony. I think that is a great name, it explains the product and also have the family name in there. "IBM SmartCloud for Social Business" is a long name for LotusLive, and perhaps not the best name. But I never thought LotusLive was a good name. I know that a few years everything cloud was "Live" (Windows Live, etc), but it felt like just another buzzword. I understand the need of IBM to group products into different families. That makes sense. But everything does not have to include "Smart". What about simply giving any cloud offering/product a "Cloud" designation? IBM Cloud Docs, IBM Cloud Mail (LotusLive Mail), etc. To me that is a no-brainer. For the traditional client side products in the Lotus family it is a bit more complicated. We all love the Lotus brand, but it has a somewhat tainted or dated sound these days. It is simply old, and people still think "Lotus 1-2-3" when they hear it. I would have no problem with IBM Notes and IBM Domino. We already have "IBM Xwork Server". What about "IBM Smart Client" (for Notes) and "IBM Smart Server" (for Domino). There, IBM got their Smart-designation, and we got a good descriptive name on the products.